Tater Tot Casserole. I know it has been made "famous" by a television show about a large family, but I have been making this recipe since the mid 1980's! I got the recipe in college while I was an after school nanny for a family where the mother, a nurse, would work the evening shift at times and leave this dinner for me to put in the oven for her husband and kids to eat later. This recipe causes completely polar opposite reactions in my house! I think it was the first dinner I cooked for my husband when we got married, and he still loves it today. My daughter loves it too, but my two sons detest it! I don't make it often any more, just an occasional treat for my hubby, but it definitely is fun to see the reactions of love and hate from my family when I do! I decided to post it, to document this "Infamous" Recipe of our family for the sake of history. 1 bag frozen tater tots. In casserole dish mix together cooked ground meat and soup. Layer green beans on top of meat mixture. 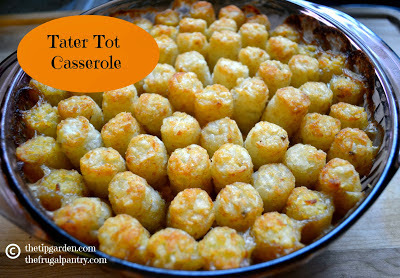 Bake 1 hour or till tots are crispy and casserole is hot and bubbly.